An album of pipe organs! Improvising jazz pianist Kit Downes also plays the church pipe organ, or rather he did. As a child, he sang in a cathedral choir in Norwich and took lessons with the organist showing an aptitude for improvising. He has maintained an interest in the organ, occasionally visiting churches to play the instrument. In November 2016, Downes recorded this CD on three organs in three churches. Saxophonist Tom Challenger is heard on one track – Modern Gods – which, on first hearing, could be Downes, but is most definitely tenor saxophone. This ECM release, as one has come to expect, is beautifully recorded and the CD’s artwork is typically that of the German label. 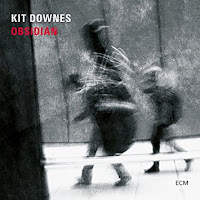 Obsidian by Kit Downes is released on ECM (ECM 2559 5782651).